The web2py_component(url, id) function is defined in "web2py_ajax.html" and it performs all the magic: it calls the url via Ajax and embeds the response into the DIV with corresponding id; it traps every form submission into the DIV and submits those forms via Ajax. The Ajax target is always the DIV itself. ajax should be set to True if the DIV has to be filled via Ajax and to False if the DIV has to be filled before the current page is returned (thus avoiding the Ajax call). 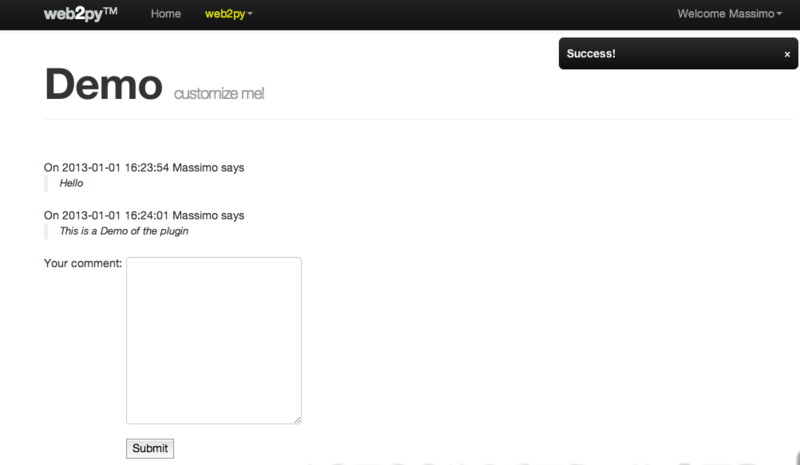 If set to False, the component's code and view will be executed in the same web2py environment as the caller. times specifies how many times the component is to be requested. Use "infinity" to keep loading the component continuously. This option is useful for triggering regular routines for a given document request. timeout sets the time to wait in milliseconds before starting the request or the frequency if times is greater than 1. It's possible to hard-code the target DIV, but in this recipe we use a query-string variable to inform the submitting-controller which component we want to reload. It's identified by the id of the DIV containing the target component. In this case, the DIV has id 'map'. Note that it is necessary to use target='map' in the LOAD of the target; without this, the target id is randomised and reload() won't work. See LOAD signature above. For more information about response.js see Client-Server component communications (below). Because Ajax post does not support multipart forms, i.e. file uploads, upload fields will not work with the LOAD component. You could be fooled into thinking it would work because upload fields will function normally if POST is done from the individual component's .load view. Instead, uploads are done with ajax-compatible 3rd-party widgets and web2py manual upload store commands. If cid is specified, the linked page is loaded via Ajax. The cid is the id of the html element where to place the loaded page content. In this case we set it to request.cid, i.e. the id of the component that generates the link. The linked page can be and usually is an internal URL generated using the URL helper . Any file can be made part of a plugin and these files are not treated by web2py any differently than other files. Except that files and folder in that have a plugin_ prefix are recognized by admin and grouper together by admin according to their postfix name. admin treats them differently, not web2py. Notice how all the code except the table definition is encapsulated in a single function called _ so that it does not pollute the global namespace. Also notice how the function creates an instance of a PluginManager. 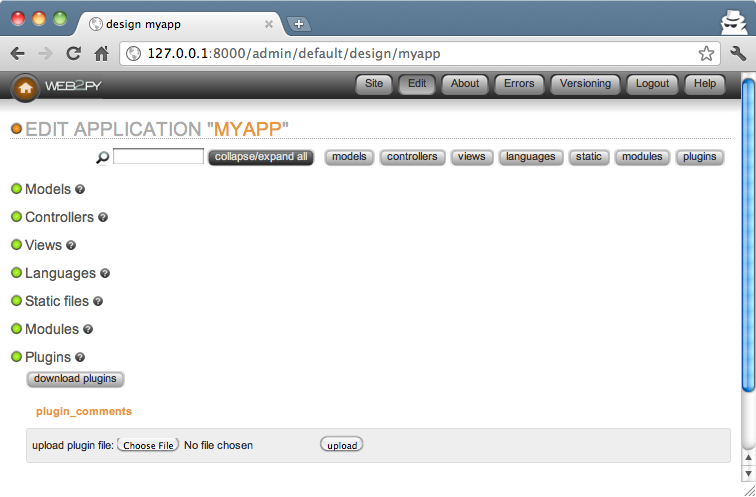 Recent versions of web2py admin allow automatic fetch and install of plugins from web2pyslices. To add a plugin to an app, edit it via the admin application, and choose Download Plugins, currently at the bottom of the screen. 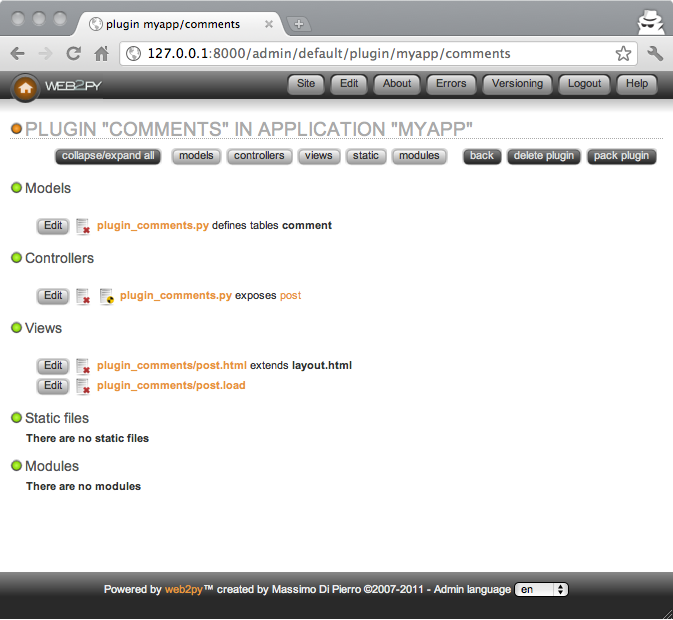 To publish your own plugins, make an account at web2pyslices.